If you’re looking for a great Christmas gift for the serious needleworker in your life, you couldn’t go wrong with the book The Art of Embroidery by Lanto Synge. This is not a technique book – it’s a history book. Synge takes the embroidery enthusiast on a journey through the development of embroidery, packing the book with hundreds of color photos that are awe-inspiring. Yes, this stuff used to be done by hand!! Some of the work is utterly unbelievable. Thumbing through the pages is almost as good as seeing the works in person, especially since Synge gives a very readable history of the techniques, people, and places in the “glory days” of embroidery’s past. You’ll not only get an in-depth look at historical embroidery in Western culture, but you’ll also be instructed on the influence of Eastern countries on the textiles in the West. If you’ve got someone close to you who loves needlework, textiles, or history, I think this would be a special gift. It makes a great coffee table book. At my house, people generally indifferent to the art of embroidery still pick it up and flip through it often, enamored by the photos and awed by the magnificent work of past ages. In the US, Art of Embroidery is available, used, through Amazon. You might also be able to find it through other used book sellers. It is currently out of print. The Royal School of Needlework’s Book of Needlework and Embroidery by Lanto Synge is also available used through Amazon. 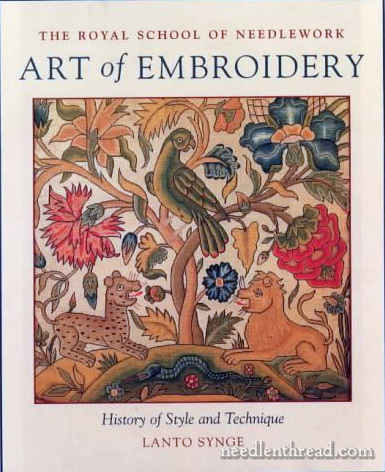 It is similar to Art of Embroidery, though Art of Embroidery is more comprehensive and a larger book overall. Having trouble getting a comment to post…. Question; do the patterns tell you which stitch to do for each part of the patterns? I would have no idea when to, for example, fill in a flower petal or outline it. If the pattern doesn’t tell you which stitch, do you just pick what you think is best? As a beginner, that would be very difficult for me. Any help is greatly appreciated. I have been interested in doing needlework for some time and am excited that I have the time now to spend learning. I am doing a teaching project on embroidery. I am interested in using this book for research. Is there any where I could buy this book. I am unable to find it on the internet. You might try a used book source, like ABE books? Or your local library – maybe they can get it on inter library loan if they don’t have it?